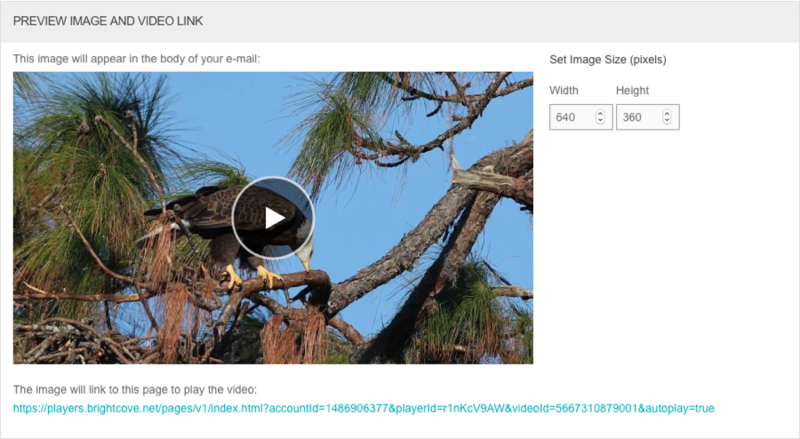 This topic provides an overview of how to publish a video to email using the Audience module. On most platforms, embedding videos directly into email isn’t possible. This isn't a Brightcove limitation, nearly every modern email system will strip out video player embed code due to security reasons. You can however, drive awareness and traffic for content by creating an email with some teaser text and a poster image. The Audience module provides the ability to select a video, player and then generate the HTML to embed inside an email message. Note: Publishing a video to email is also available in the Media module. For information, see Publishing a Video to Email. Click Publish to Email in the left navigation. Select a Landing Page. The dropdown list will contain a Simple Landing Page which is a system provided, unstyled sample landing page. 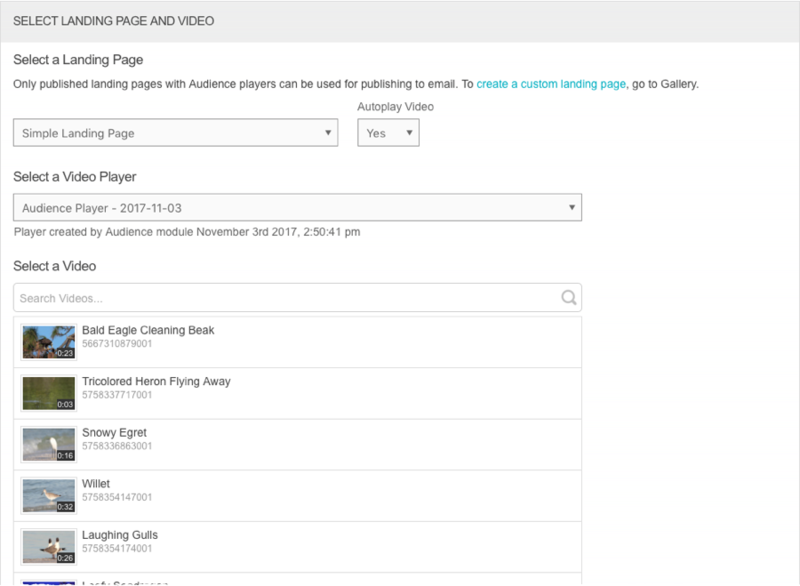 The list will also contain any published landing page experiences that were created using the Gallery module that are using an Audience-enabled player. Using a Gallery landing page provides more flexibility over the appearance and styling of the landing page. Lead forms can also be used to capture viewer information. For more information on creating Gallery landing pages, see Creating a Landing Page Experience. Select a Video. Search terms can be used to search the videos in your account. Set the Image Size. This is the image that will appear in the body of the email. The size of the image can be adjusted by entering values into the Width and Height fields. The player URL will display below the poster image. Select the application that will be used to send the email. The following options are available. The HTML to embed will change depending on the application that is selected. The process to send email messages from marketing automation platforms is outside the scope of this topic. For information, see the Eloqua, Marketo, HubSpot or Salesforce documentation.